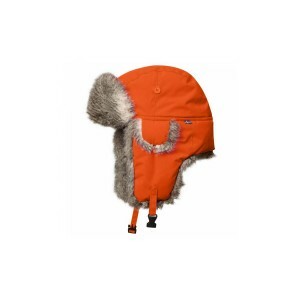 Robust winter hat for hunting in very cold conditions. Made from silent, soft polyester that resists moisture with soft synthetic fur on the brim and earflaps that protect against icy winds. The earflaps can be fastened under the chin with a press button. There is also a pair of extra, smaller earflaps with “hearing holes” that let in sound and can be folded up and fastened into place with a button, or folded down when the wind is cold. Warm hat for hunting in cold conditions. Made from a water repellent polyester fabric for days with changeable weather. Small earflaps with "hearing holes" let in sound and can be folded up and fastened with a button when not in use.